We take very seriously the security of your belongings. That’s why our facility is protected by security company monitored video surveillance for your peace of mind and for an immediate response if an alarm is sounded. Only the renters have access to the facility and to only their individual, sealed storage units. Safe Self Storage is conveniently located just off Ogden Road with easy access to Deerfoot Trail via nearby Barlow Trail. 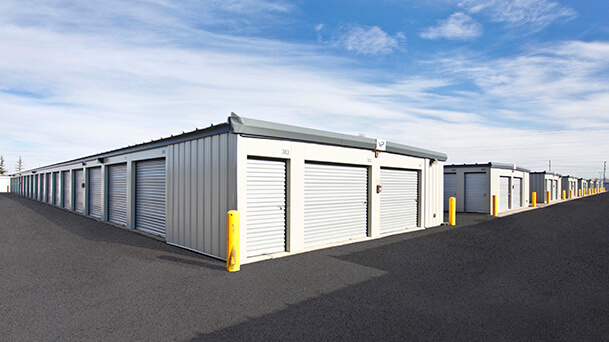 We offer many differently sized storage units, so that you only need to pay for the space you need. Our Calgary self storage facility also features some drive up units for those larger loads or if you just want the convenience of being able to walk directly into your self storage unit from your truck. There is a loading dock to assist you in loading and unloading from your moving truck, and we have plenty of carts available on site so you can move your belongings easily to your storage unit. We are also pleased to be able to offer a document and record storage service. This facility is a gated secure monitored alarmed facility which offers heated and non heated units within inner city.